The best teaching materials for Sign Language! Havemore success in your Sign Language classes! Motivating stories and activities that enhance your students' fluency greatly. Enjoy your classes more and obtain better results via TPR Storytelling. Would you like to know more about this successful teaching method? Read Fluency through TPR Storytelling or check out the International Sign teacher trainings of Gebarentaal voor Iedereen. Teacher's guide for the first level of the Dutch Sign Language course with TPRS: stories, communication and interaction with humour and lots of Deaf culture. Student book for the first level of the Dutch Sign Language course with TPRS: stories, communication and interaction with humour and lots of Deaf culture. PowerPoints to use with for the first level of the Dutch Sign Language course with TPRS. Student book for the second level of the Dutch Sign Language course with TPRS: stories, communication and interaction with humour and lots of Deaf culture. Teacher's guide for the second level of the Dutch Sign Language course with TPRS: stories, communication and interaction with humour and lots of Deaf culture. PowerPoints for the second level of the Dutch Sign Language course with TPRS: stories, communication and interaction with humour and lots of Deaf culture. Teacher's guide for the third level of the Dutch Sign Language course with TPRS: stories, communication and interaction with humour and lots of Deaf culture. Student book for the third level of the Dutch Sign Language course with TPRS: stories, communication and interaction with humour and lots of Deaf culture. 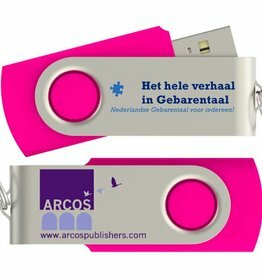 Docentenhandleiding bij de cursus Het hele verhaal - Nederlandse Gebarentaal voor iedereen! Gedetailleerde lesplannen met toch veel ruimte voor eigen creativiteit. Bestel nu! Inspiring guide for language teachers. Make your students' stories, ideas, and concerns into lively conversation lessons through the use of super-simple drawings as cues for speaking.